One of the things in the computer industry that hasn't really evolved, and perhaps has even deteriorated due to the adoption of 16:9, is the resolution of LCD displays. Fortunately, things may be looking up as Intel announced plans to significantly increase the pixel density of screens across all product categories! 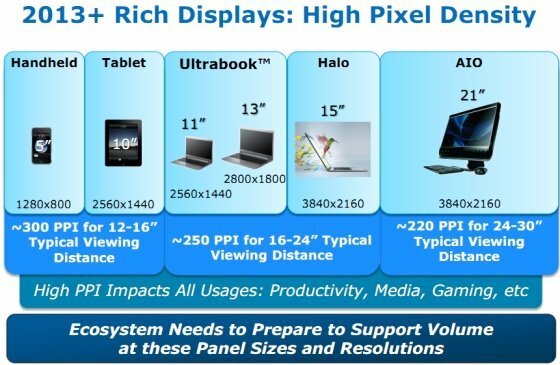 According to a slide obtained by Liliputing, Intel is pushing device makers to adopt "rich displays" by 2013+. Phones and other handhelds with 5" screens should get 1280 x 800 pixel screens, while 10" tablets and ultrabooks with an 11" screen will adopt 2560 x 1440 pixel displays. The 13" ultrabooks should get 2800 x 1800 pixel screens, and 15" laptop users will be able to ditch their 1366 x 768 screens in favor of a 3840 x 2160 pixel resolution! The latter resolution will also be used for all-in-one desktops with screen sizes of 21". Unfortunately, details about regular LCD monitors for desktop PCs aren't included in the slide.